DDC OS UK | 8x8, Inc. Established in 1987 and headquartered in England, business process outsourcing (BPO) specialist DDC OS provides back office processing, customer lifecycle and knowledge processing services. Its list of clients includes GB Energy Supply, South Easter Water, Robin Hood Energy, the Charity Commission, Lewisham Council and Christian Aid. The company is part of The DDC Group, which has a multilingual workforce of over 5,500 employees spread across offices in 12 locations around the world. To support ambitious growth plans and deliver superior customer experience, DDC OS wanted a communications system that would enable it to deliver the highest level of service, encompassing voice, video conferencing, contact centre, team messaging and collaboration. However, the company faced three significant challenges: DDC OS lacked a centralised communications system; the solution needed to support several disparate channels; and competition was intensifying within the BPO marketplace. Chrissie Spencer—Head of Group Marketing. 8x8 provided the answer with its flagship solution, the 8x8 X Series. This ground-breaking unified communications and contact centre platform helps businesses transform their customer and employee experience. 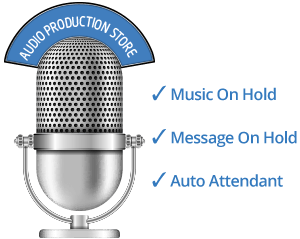 It provides a single system of engagement across contact channels as well as capturing intelligence on a single cloud platform. For an organisation like DDC OS, it was vital that any new system would not disrupt service for its customers and that downtime was kept to a minimum. With 8x8’s support, DDC OS encountered few obstacles during implementation. And now DDC OS can ramp up customer teams, often made up of dozens of full-time employees, to full productivity in as little as two days. 8x8’s global presence and hands-on approach enabled staff to be trained quickly. Meanwhile, account and customer success teams stayed in close touch with DDC OS throughout. This also ensured that 8x8 was seamlessly integrated with existing systems, such as its workforce management tool. Outstanding control: With 8x8 X Series in place, DDC OS can gather full insight into the full customer journey with Customer Experience journey maps. “The 8x8 solution enables us to bring everything together into a single dashboard, connecting the dots between all the disparate pieces of information that we have in constant motion,” explains John Callachan, the company’s Managing Director. 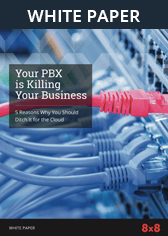 Managers can see why customers are calling and how they can reduce call volumes. The company’s schedules are based on call volumes and service levels and so by integrating 8x8 with its workforce management tool DDC has been able to track and measure the adherence to these schedules, which has increased from 80% to 96%. Substantial cost savings: High service costs had been an issue. But with the new 8x8 X Series platform, DDCOS reduced its costs by around 35%. “The subscription pricing model means that we haven’t had to make capital expenditure or invest in infrastructure to support the system,” says John Callachan. Excellent flexibility: The new system has empowered the business to offer more flexible and remote working options to staff. And if any offices must be closed (due to weather, power outages, etc. ), 8x8’s cloud-based system enables business continuity — as DDC OS can continue providing excellent customer service from other locations. Faster resolutions: The average handling time of customer service agents has reduced from over 12 minutes to under 10 minutes. Integrated CRM capabilities provide agents with a full view of a customer’s history, shortening talk times as customers no longer have to recap previous interactions. And the Expert Connect feature enables agents to engage the right experts during a call. This has resulted in a massive improvement in first contact resolution, with call volumes falling by 8%. Callback request: Using 8x8 Customer Experience reporting, DDC OS managers can now pinpoint and improve areas where the Interactive Voice Response (IVR) has led to customers abandoning calls. To prevent any frustration if queue times are long, customers are offered the option to request a callback instead of waiting in queue. The changes have reduced call abandonment from 7% to under 3%. Customers satisfied: Since working with 8x8, the business has introduced customer surveys to its IVR, using Post-Call Survey. This has helped the company to target and fix the worst call experiences. 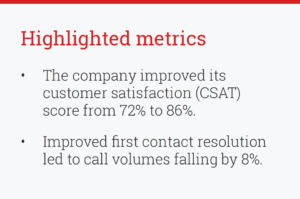 After just two months, the company improved its customer satisfaction (CSAT) score from 72% to 86%. Greater business agility: The cloud-based architecture gives DDC OS the ability to resource new projects instantly, anywhere in the world. The intuitive interface also enables new employees to become confident and productive quickly. “The agility of our 8x8 deployment provides us with yet another differentiator over our competition,” says Chrissie Spencer. With 8x8 X Series, DDC OS has strengthened its ability to provide excellent service to outsourcing clients the world over. In fact, DDC is now the leading outsourcer for the utilities sector. 8x8’s compatibility capabilities has meant that DDC OS can work easily with its customers’ disparate systems and environments. 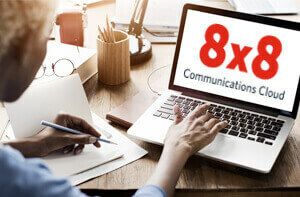 “We’re frequently asked about integrating our own core applications with those of our clients: As 8x8 has already certified integration with many leading CRM packages, we can invariably accommodate these kinds of requests,” explains Chrissie Spencer. 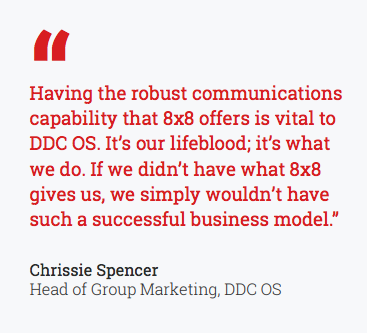 DDC OS has strengthened its position in the global business process outsourcing arena, thanks to the 8x8 X Series, a ground-breaking platform that helps companies transform customer engagement across contact channels. With 8x8 X Series, DDC OS has gained a wealth of benefits including deeper customer insights, significant cost savings and the ability to deliver a superior customer experience.